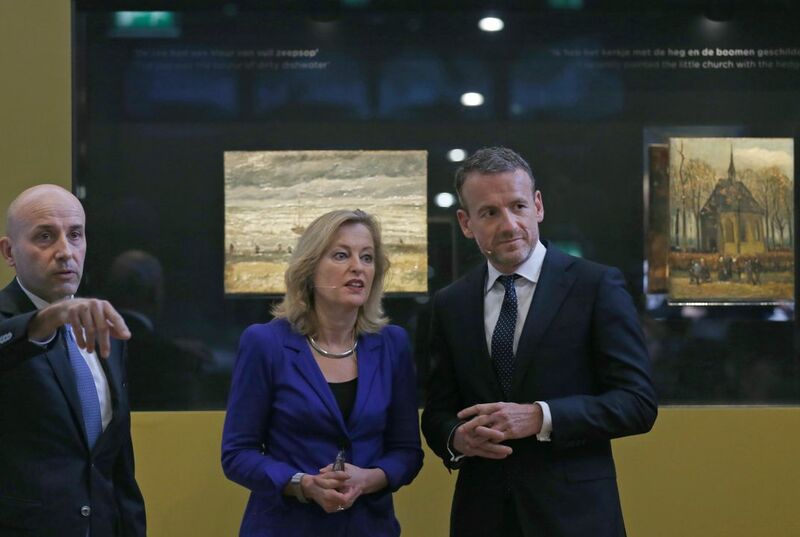 The Van Gogh Museum in Amsterdam has welcomed home two paintings by the Dutch master. More than 14 years ago, they were ripped off the museum's wall in a nighttime heist. "They're back," said museum director Axel Rueger. He called their return one of the "most special days in the history of our museum." The paintings are the 1882 "View of the Sea at Scheveningen" and 1884-85 work "Congregation leaving the Reformed Church in Nuenen." They were discovered last year by Italian police. They were investigating suspected Italian mobsters. It wasn't an easy find. The two paintings were wrapped in cotton sheets. They were stuffed in a box. Then they were hidden behind a wall in a toilet. That is according to Gen. Gianluigi D'Alfonso of the Italian financial police. He was on hand at the museum March 21 to watch the ceremonial unveiling. The paintings were found in a farmhouse near Naples. Italian police seized some 20 million euros worth of assets. They included villas, apartments and even a small airplane. "After years shrouded in darkness, they can now shine again," Dutch Minister for Education, Culture and Science Jet Bussemaker said. An orange screen slid away to reveal the two paintings behind a glass wall. Italy's Interior Minister Angelino Alfano said last year the paintings were "considered among the artworks most searched for in the world." Although they are now back on display at the museum, they soon will be taken to its conservation studio for repair. Fortunately, they suffered remarkably little damage. The thieves had clambered up a ladder and smashed a window to get into the museum in 2002. The paintings were ripped out of their frames. The museum director was on vacation when the call came last year from Italian authorities. The police believed they had recovered the paintings. Rueger didn't celebrate right away. That is because he'd had calls like this before. "I was hopeful but also a little hesitant. Because over the course of the years, we had multiple occasions when people phoned us, contacted us, claiming that they knew something about the whereabouts of the works. And each time it was false, the trace went cold," he said. "So...the way has been peppered with disappointment." "It was something we had secretly been hoping for for all those years," he said. The two small works are not typical of Van Gogh's later and better-known works. But they are still vital pieces for the museum's collection, Rueger said. "He had painted it as a gift to his mother, so it's a very personal and emotional connection," Rueger said. Rueger said the paintings are now back for good at the museum. It is home to dozens of works by Van Gogh. His paintings fetch millions of dollars on the rare occasions they come up for auction. "I'm very confident that everything is safe in the museum," he said. Why would anyone steal a famous painting? People would steal a famous painting because they could make money off it and get rich. In response to "this article," I agree that the paintings shouldn't have been stolen from the museum but I am happy they were returned. One reason I agree is that the painting were very unlikely to be returned. Another reason is that The painting of the church in Nuenen portrayed the village where his parents live. It says in the article He had painted it as a gift to his mother, so it's a very personal and emotional connection. A third reason is that the museum is home to dozens of works by Van Gogh. Even though, I think the people shouldn't have stolen those paintings. All I want to know is why people would steal such famous paintings? Anyone, more particularly, criminals, steal famous paintings because it gives them the better impression amongst other criminals. Individuals tend to have their main motivation with the strategy of showing off by committing harsher crimes, such as, in this article, the famous painting. It is known how people arrange and set the plan to steal a painting, but later on criminals realize they don't know what to do next or what act to commit next with the painting they've stolen. One may ask or wonder if they sell a painting of such, for instance, Van Gogh's multimillion dollar painting, on the internet. Well, authorities have the chance to become undercover cops and pretend to be a buyer, which is where there is a finalization of the case. 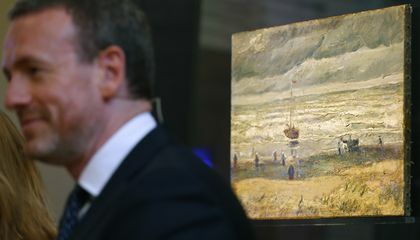 So they can sell the painting to the highest bitter and would earn a lot of money or would steal it and trade it for valuables from the city to be rich. It is a great thing that these are back at the museum. I personally don't care about art but i understand the significance. It is pretty cool after all these years that the police have found these stolen paintings. they would steal a famous painting to sell it for money. I am happy that the paintings are back in the museum. But why would these people steal the paintings and not sell them. If i robbed the paintings i would sell them and not keep them in a box and hidden behind a wall in a toilet. I really don't care about art, but i think this topic is really cool. People often steal famous paintings in effort to sell them for a high price upon a black market website. Many thieves often recreate faulty paintings while in possession of the legitimate painting to deceive multiple people into paying full price to maximize profit. its cool that they found the paintings and that they were able to return it in good condition. personally i think that items like these need to be closely guarded and hopefully they will take better safety precaution to make sure this doesn't happen again. its a shame that people steal.